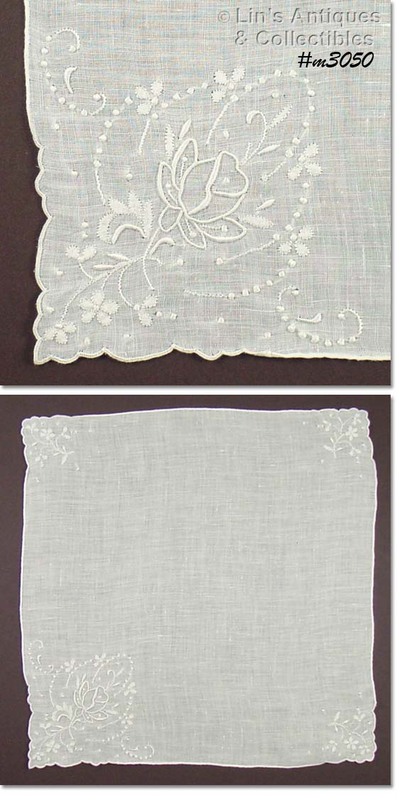 THIS WHITE HANDKERCHIEF IS ELEGANTLY SIMPLY – WHITE WITH ATTACHED NYLON EDGING THAT HAS A LOVELY STITCHED DESIGN! THE NYLON EDGING IS AN EVER SO SOFT PALE (PISTACHIO) GREEN COLOR -- SIMPLY BEAUTIFUL! HANKY MEASURES 13 ½” X 13 ½” AND IS IN EXCELLENT CONDITION. THIS IS A GORGEOUS WEDDING HANKY WITH LOTS OF DETAIL! HANKY MEASURES 14 ¼” X 14 ¼” AND IS IN EXCELLENT CONDITION. THIS IS AN ABSOLUTELY BEAUTIFUL WEDDING HANKY! IT MEASURES 12” X 12” AND IS IN EXCELLENT CONDITION. PLEASE SEE PHOTO TO FULLY APPRECIATE THE DETAIL AND WORKMANSHIP ON THIS HANKY! THIS IS A LOVELY WEDDING HANDKERCHIEF WITH LOTS OF DETAIL! MEASURES 11” X 11”. EXCELLENT! 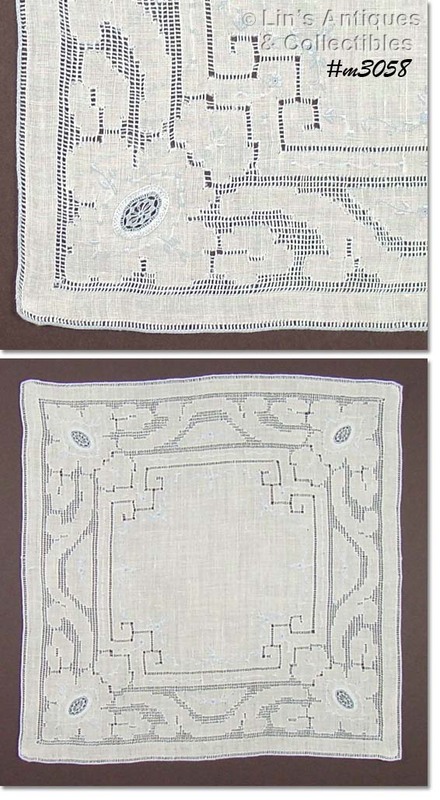 THIS IS AN ABSOLUTELY BEAUTIFUL, HEIRLOOM QUALITY, WHITE HANDKERCHIEF! 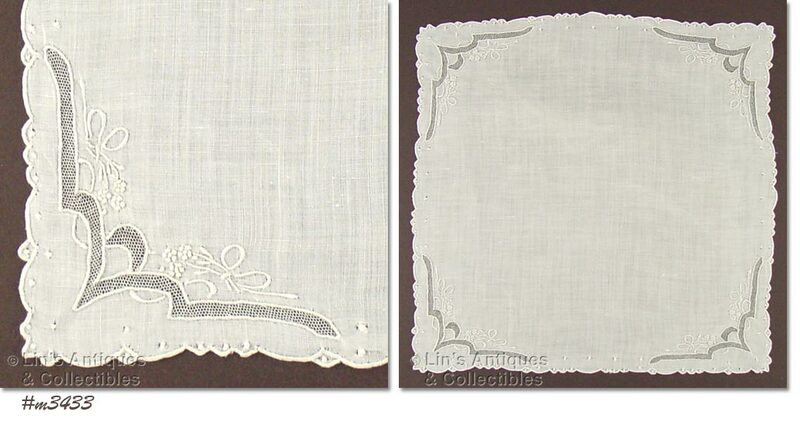 IT’S MEASURES 10 ¼” X 10 ¼” AND WOULD BE AN EXCELLENT WEDDING OR FIRST COMMUNION HANDKERCHIEF! ANOTHER HEIRLOOM QUALITY WEDDING HANDKERCHIEF! IT MEASURES 12 ½” X 12 ¾” AND IS IN EXCELLENT CONDITION. 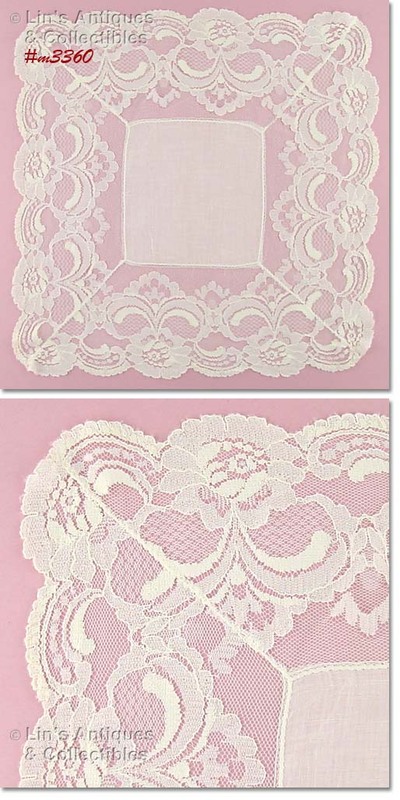 THIS IS ONE OF THE PRETTIEST WEDDING HANDKERCHIEFS IN OUR INVENTORY! 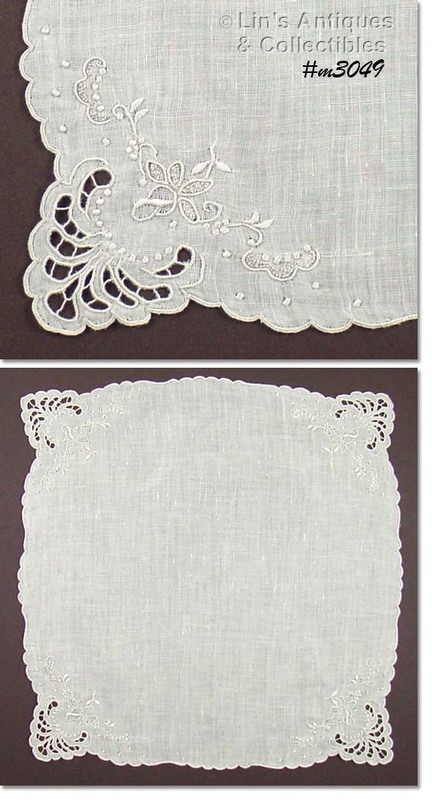 IT MEASURES 14 ½” X 14 ½” – THE LACE PORTION IS 4 ¾”! EXCELLENT CONDITION AND HEIRLOOM QUALITY. 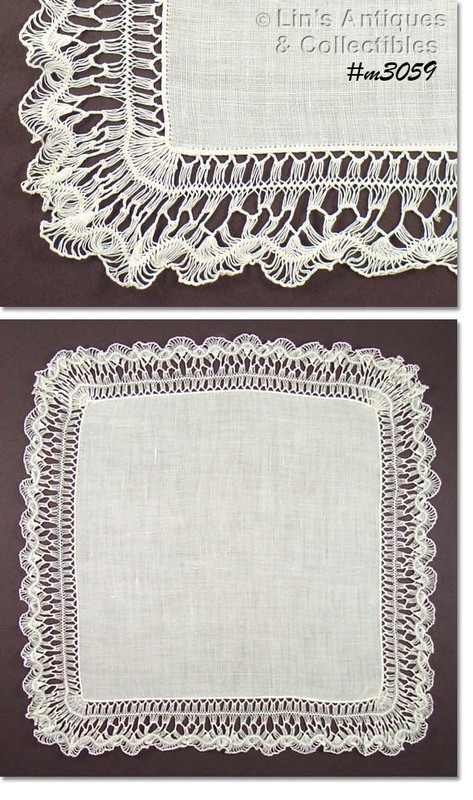 ABSOLUTELY BEAUTIFUL BRUSSELS LACE HANDKERCHIEF! IT MEASURES 9 ¼” X 9 ½” AND IS STILL IN THE ORIGINAL PACKAGE (I REMOVED IT TO TAKE MEASUREMENTS). THIS WOULD BE A GORGEOUS WEDDING HANDKERCHIEF! THIS IS A BEAUTIFUL WEDDING HANDKERCHIEF! IT’S WHITE WITH WHOTE FLORAL NETTING EDGING. HANKY MEASURES 11 ¾” X 12”. THESE HANKIES ARE HEIRLOOM QUALITY! THEY ARE IN THE ORIGINAL BOX AND HAVE NEVER BEEN REMOVED/USED. I REMOVED THE STRAIGHT PINS THAT WERE HOLDING THE HANKIES TO A PIECE OF PAPER. THESE HANKIES HAVE AGE/STORAGE YELLOWING – I HAVE NOT LAUNDERED BUT WILL AT BUYER’S REQUEST. THIS WHITE WEDDING HANKY IS DAINTY AND VERY FEMININE! 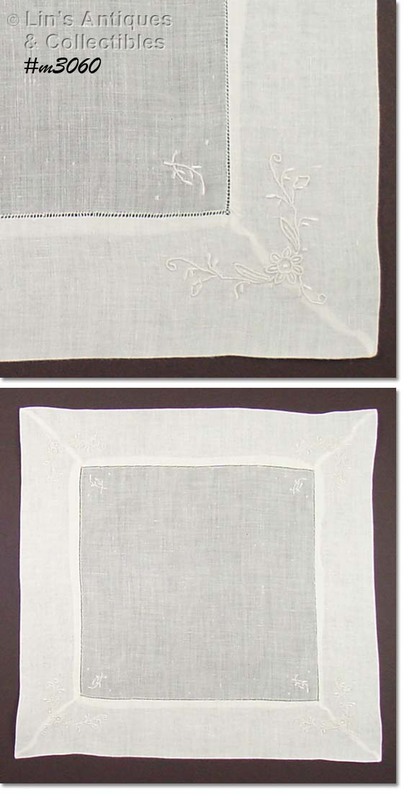 THE HANKY IS WHITE LINEN WITH A NYLON BORDER/EDGING AND IT HAS BEAUTIFUL FLOWERS IN EACH CORNER. MEASURES 10 1/8” X 10 1/8” AND IS IN EXCELLENT CONDITION. 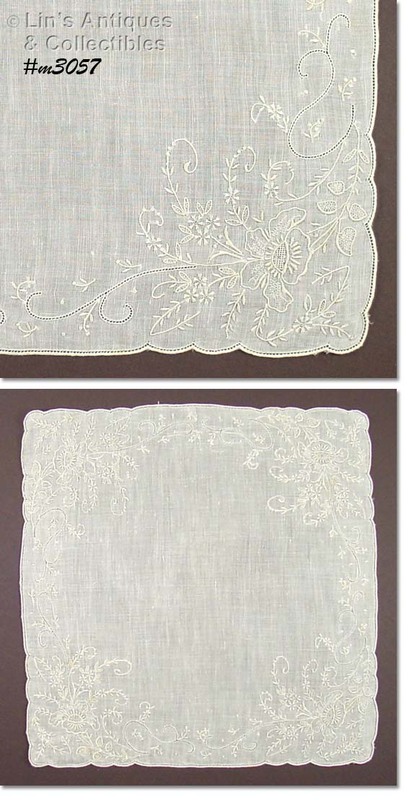 THIS WEDDING HANKY IS ABSOLUTELY ELEGANT AND IS HEIRLOOM QUALITY! 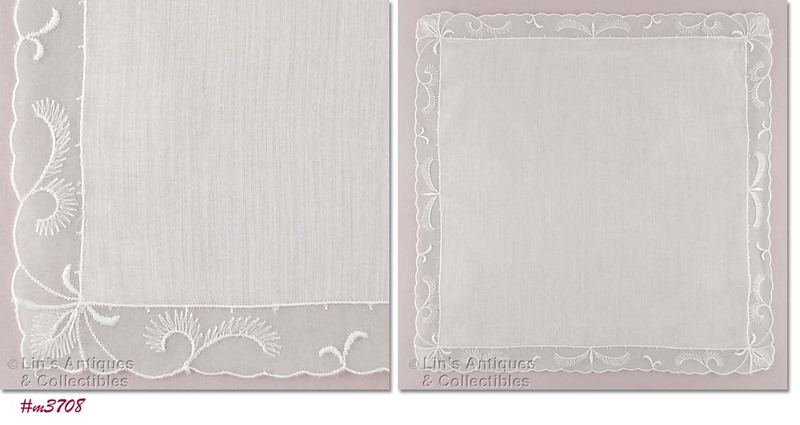 IT’S MADE OF FINE LINEN WITH A DOUBLE BORDER/HEM AND BEAUTIFULLY EMBROIDERED FLOWERS IN EACH CORNER. MEASURES 11 ¼” X 11 ½” AND IS IN EXCELLENT CONDITION. DON’T MISS THIS ONE – IT IS OUTSTANDING! HIS BEAUTIFUL HANDKERCHIEF IS ELEGANT SIMPLICITY! 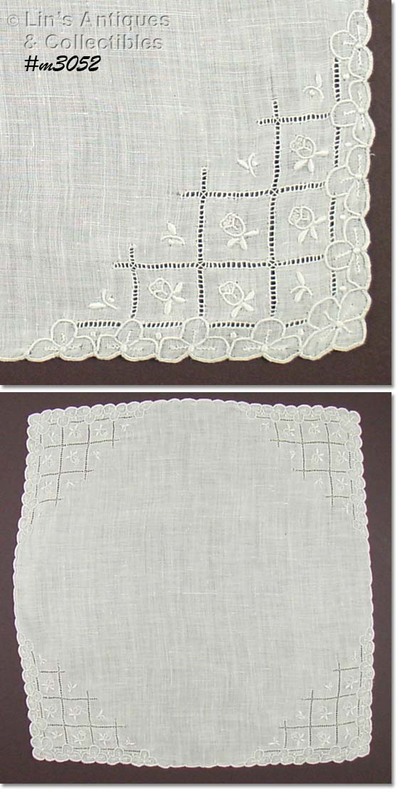 THE WHITE LINEN HANKY MEASURES 11” X 11” AND THE CROCHET BORDER/EDGING IS AN ADDITIONAL 2”. THE CROCHET IS VERY DETAILED – SOMEONE SPENT A GOOD DEAL OF TIME TO MAKE THIS A VERY SPECIAL HANDKERCHIEF. 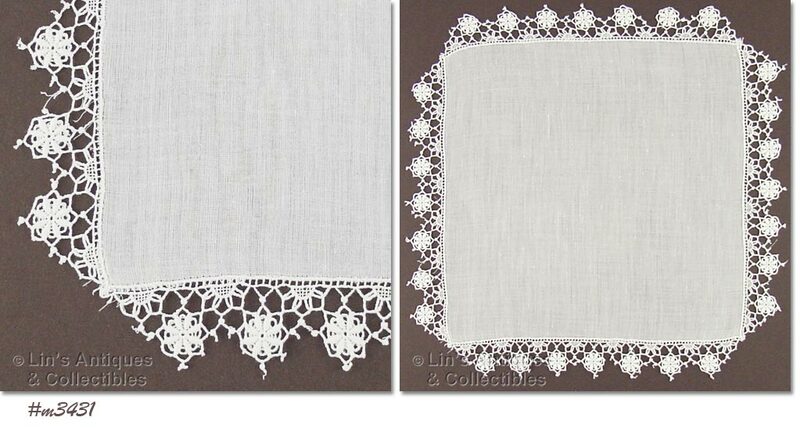 THIS VERY DETAILED HANKY WOULD BE A BEAUTIFUL WEDDING HANKY WITH A TOUCH OF COLOR! HANKY IS WHITE WITH PALE BLUE STITCHING, MEASURES 10 ¾” X 10 ¾”, AND IS IN EXCELLENT CONDITION. THIS HANKY HAS LOTS OF BEAUTIFUL EMBROIDERY! HANKY MEASURES 11 ½” X 11 ½” AND IS IN EXCELLENT CONDITION. THIS IS ANOTHER LOVELY MADEIRA HANKY! MEASURES 11 ½” X 11 ½” AND IS IN EXCELLENT CONDITION! ANOTHER BEAUTIFUL WHITE HANKY THAT IS SUITABLE FOR USE AS A WEDDING HANKY! MEASURES 11 ¼” X 11 ¼” AND HAS LITTLE ROSEBUDS AND PANSIES IN EACH CORNER. WOW – LOOK AT THIS HANKY – IT’S GORGEOUS! MEASURES 10 ¾” X 10 ¾” AND IS IN EXCELLENT CONDITION. ANOTHER BEAUTIFUL WHITE MADEIRA HANKY THAT IS SUITABLE FOR USE AS A WEDDING HANKY! IT MEASURES 12 ¼” X 12” AND IS IN EXCELLENT CONDITION. LOVELY! THIS MADEIRA WEDDING HANKY IS BEAUTIFUL AND IS HEIRLOOM QUALITY! IT MEASURES 11 ¾” X 11 ½” AND IS IN EXCELLENT CONDITION.